Millions of women apply makeup everyday. But, not all makeup is created equal. Youngevity’s Mineral Makeup includes only the finest and most pure ingredients, 100% pure minerals to nourish your skin. Never will you find chemicals, fragrance, talc, bismuth, dyes or preservatives in this beautiful, natural makeup. The Youngevity Social Mineral Makeup Kit includes sample foundation towers in colors from light to dark, perfect for color matching your guests. Also included are the Waterless Vitamin C, Morning Hydration Cream Moisturizer, three Professional Brushes, Euphoric Blush, Berry Kiss Liplock, Bronzer, and Finishing Powder. Everything you need to demonstrate the flawless coverage, perfect complexion match, and airy feel of Youngevity’s Mineral Makeup. 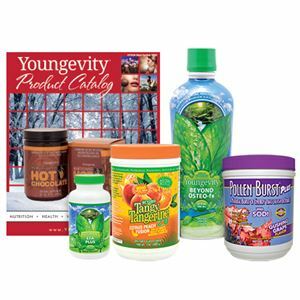 Also included are Youngevity Personal Care Catalogs.